The new PSC RF MULTI SMA contains two, separate, active 1 x 8 RF splitters for use with up to eight diversity receivers. This compact, rugged device was designed using the latest super low noise amplifiers and will operate over an extended frequency range of 470 to 870 Mhz. Its two inputs are traditional BNC connectors for ease of use in interfacing with your external antennas. Each of the outputs offers a typical isolation factor of 24 to 28dB between radio receivers. 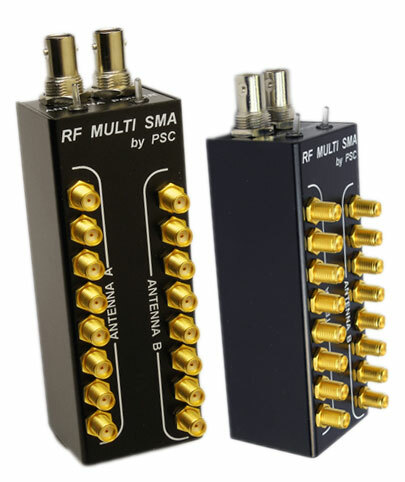 The PSC RF MULTI SMA also has the ability to power external powered antennas or remote line amplifiers. There are two top panel mounted switches. One controls overall power and the second switch provides remote antenna power when needed. Both switches light up when in use. This unit is powered from any external DC source of 10 to 15Vdc via the bottom panel mounted 4 pin Hirose connector. A sturdy belt clip is included for ENG bag use.